This guest post is contributed by Jackie Bolen (More about Jackie). In this article, I’m going to compare these reusable options to the disposable ones (pads and tampons), to figure out which ones comes out ahead. 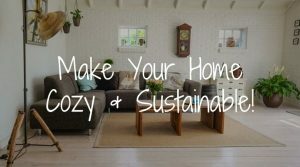 I’ll look at a few different categories: cost, environmental impact, health benefits and ease of use. Pads and tampons are expensive, especially if you have a heavy and/or long period. $5 per month on period products is the minimum that most people would spend—others spend almost double that. Per year, that adds up to $60 and over a lifetime (40 years menstruating), it’s over $2000. Compare this to a menstrual cup which costs $30. Some companies recommend replacing it every year, but with proper care and cleaning, they often last 5-10 years. This means that the average person would need 4-8 of them in a lifetime, at a total cost of $120-240. Cloth menstrual pads offer similar savings to menstrual cups. They have an average cost of $5 per pad, and last for years if you care for them properly. You can potentially save thousands of dollars using reusable pads instead of disposables over a few decades. Cost: reusables for the win! Pads and tampons are a small part of the bigger plastic waste problem. Slate estimated that the average person produces 300 pounds of waste from disposable feminine hygiene products over their lifetime. Due to the nature of these products, they can’t be recycled, and many of them contain plastic, which isn’t biodegradable. This perhaps isn’t such a huge amount when compared to other categories of consumer goods. However, almost the entire amount can be avoided by switching to reusables. Menstrual cups can often be recycled, depending on where you live. Cloth menstrual pads are made from natural materials and will biodegrade once thrown away. Environmental impact: reusables for the win, hands down! Here’s something else you might not know, but will wish you did years ago! In the USA, disposable pads and tampons are classified as medical devices by the FDA. This means that manufacturers aren’t required to disclose what’s in them. Studies have shown that they often contain trace amounts of pesticides and chemicals, including dioxins. It’s thought that these compounds cause cancer with repeated exposure to them. Organic disposables come without the risk, but are often quite expensive. The best menstrual cups (Diva Cup, MoonCup, Lunette Cup, Lena Cup, Anigan Evacup) are made from medical grade silicone and won’t leach any chemicals into your bloodstream. The key is to avoid the cheap menstrual cups ($5-10 on Amazon) which degrade very quickly because they’re not made from top-quality materials. Cloth menstrual pads (the organic ones are best), contain no chemicals after a few washes. To date, there has been one reported case of toxic shock syndrome (TSS) with menstrual cups; there have been thousands with tampons. Health benefits: another win for reusables. The last thing we’re going to look at is ease of use. Disposable products are very simple to use. It’s actually quite difficult to insert a tampon incorrectly. Disposable pads do a good job at preventing leaks and are easy to put in the correct position. When you’re done, you throw them into the trash and don’t have a second thought about it! Menstrual cups require a bit more work than tampons. They come with a learning curve, and it takes most people 4-5 cycles to get them to not leak. 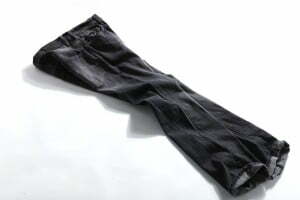 It can also be a bit difficult to find the correct one for your body size and shape. They do, however, have a capacity 3-4 times more than even a jumbo tampon, which makes them a particularly good choice if you have a heavy period. Cloth menstrual pads are slightly less absorbent than their disposable counterparts. Another disadvantage is that they can shift around quite easily, especially when exercising. You may have to try a few different brands to find one that works for you. Let’s talk cleaning. Menstrual cups do require a bit of work, both during your period, and after. It’s not a big deal, but it will take you a bit of time. Cloth menstrual pads are washed along with your regular laundry, so it’s also not a big problem, but it’s a bit more work than just throwing something into the trash. Ease of use: disposables with the slight edge. 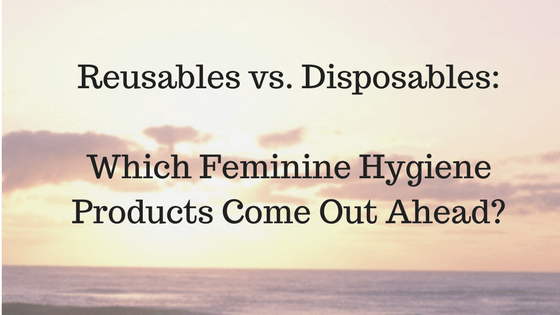 Reusable feminine hygiene products have the clear edge over disposables for a whole number of reasons. Are you ready to make the switch? Jackie Bolen is a tree-hugging, friend of the Earth who can often be found catching a wave, on top of a mountain, or drinking organic coffee around Vancouver, Canada. Her hope is that one day, a reusable feminine hygiene product will be found in the hands of every single menstruating person in the world.